Winter is coming, and in the cold climate of Glasgow, Scotland, locals are looking forward to a seasonal event that is sure to warm the cockles of any music lover’s heart. Defying the frost from January 19th to February 5th, 2017, the Celtic Connections Festival will bring over two thousand musicians from all across the globe to Scotland’s second city. What follows are eighteen days of music, art, dance, talks, and workshops that raise the temperature in wintry Glasgow. Billed as a folk, roots, and world music festival, Celtic Connections is not only a celebration of Celtic music but also of the intricate relationships between musical forms in cultures worldwide. Its first incarnation was back in 1994 in the Glasgow Royal Concert Hall and attracted an audience of 35,000 music lovers. With acts like a young Sharon Shannon, De Dannaan, and The Chieftains, the new festival proved it could attract big acts. With primary focus on the music, 94’s Fashion Show event turned out to be a one-off and was never repeated. By the time of the festival’s tenth running in 2003, the acts playing were bigger and bigger names ‒ angel-voiced Irish songstress Sinead O’Connor, Bob Geldof, Eddi Reader with the Royal Scottish National Orchestra, and The Waterboys. 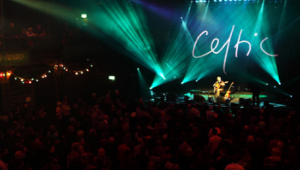 Flash forward to Celtic Connections’ twentieth anniversary in 2013 and by this point the festival had truly established itself as a stage for world music acts. Artists from Mali, Senegal, Angola, Brazil, and India, to name but a few, travelled to be part of the growing reputation of the event. Over the years, the festival has garnered praise from all sides, being hailed as a ‘miraculous’ success when considered alongside its seasonal disadvantage, competition from other music events, and the shoestring budget on which it is run. What sets Celtic Connections apart from other festivals is its open-minded spirit of adventure and collaboration. In one-off shows, the most fascinating and complementary pairs and groups of musicians are brought together to make art together with outstanding results. These are sessions and pairings that one might never see or hear again, making them all the more special. And the late-night Festival Club is the place to hear the music and impromptu sessions continue into the wee hours as artists from all over make magic together. 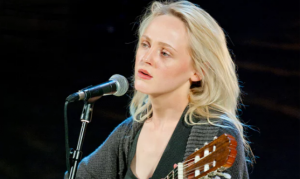 The 2017 line-up is already exciting the hosts of festival goers, with Brit award winner and three-time Mercury Prize nominee Laura Marling, joined by the BBC Scottish Symphony Orchestra, setting the bar very high on the opening night of January 19th. There are some ‘special guests’ on the bill for this show at the Royal Concert Hall. The following night in the same venue, Californian alt-country rockers Calexico, who embrace Mexican musical elements will be joined by Guatemalan Gaby Moreno, winner of a Latin Grammy. As the 2017 festival brings to the fore music made in spite of adversity, the Drygate Brewery welcomes the Saharawi singer Aziza Brahim. Brahim was born in a refugee camp in Algeria and has yet to visit her Western Sahara homeland which has been occupied by Morocco since 1975. With broad international influences her music speaks of her people’s plight and that of her home, now a militarised contested zone. Expect plenty of fascinating workshops to be added as the programme is confirmed, along with visual art exhibitions, ceilidhs (Irish dances), and a host of free events. Highlight of the closing night will no doubt be the BBC Radio Scotland Young Traditional Musician of the Year. As six rising stars of the trad scene will perform in hope of winning the top honour, this show promises to showcase the talent of future festivals.